Note: This tip works equally well when editing an email in Outlook. Press ALT as you CLICK + DRAG to end point. Once selected the text can be formatted or deleted. The selection collapses after your executed command. * (a deadly neolithic creature hellbent on correcting ingesting your text and regurgitating its own). Watch this 1m video for more. Here’s another cool feature of Excel: Speak Cells on Enter. This can prove valuable as a means to verify accurate data entry. The only setup required is to add a button to your Quick Action Toolbar (QAT). RIGHT + CLICK on the QAT and select Customize Quick Access Toolbar. Set the Choose commands from drop-down to All commands, then scroll down and select Speak Cells on Enter. The button now appears on your QAT. Click button to toggle the feature on or off. When active, each time you enter in a cell, the cell contents will be read back to you. Unlike other reader programs this voice is clear and rather pleasant (take note Acrobat). Now if only you could select the voice, I’d take something along the lines of a HAL 9000, or K.I.T.T. model. *available only to select consumers. What, I am not one of them? I am so! You keep out of this. Author quincy harley jrPosted on May 1, 2013 Categories Excel, TechTags Excel, Excel 2007, Excel 2010, Excel 2013, Office, TipsLeave a comment on Excel Speaks! Here is an old favorite* Word Tip. Looking for an easy method to move a table row up? Place cursor on the row. Press ALT + SHIFT + Up Arrow. Repeat as necessary until the cursor is elevated to desired position. As you probably guessed, pressing ALT + SHIFT + Down Arrow moves the selected row down. Okay, admittedly that last one was just wishful thinking :). * Tip applies to Word versions 2003, 2007, 2010, and 2013. This tip may be relevant in earlier Word versions, but to confirm this I would have to pull out my old PC from its resting spot, on a shelf, under a pair of acid-wash jeans, wedged between an un-seeded Chia Pet and my Commodore VIC 20. Here’s a quick Office tip that applies to Word, Excel and PowerPoint. The Mark as Final feature enables you to protect a document to discourage editing. This simple seal of protection can easily be removed by the reader, should it be determined editing is necessary. Note, this option is not designed to prevent edits, only to ward against unintentional editing. To render the document un-editable use other alternatives (for example, saving the file password protected or distributing a PDF version of the file). When backstage view is active, a notice appears in the status bar, indicating, “An author has marked this … as final to discourage editing.” The Application title bar also indicates that the file is Read-only. Reading, printing, and viewing options continue to function, but all editing features are disabled. To remove the Mark as Final setting and restore edit functions repeat step 1, above. Alternatively, you can click the Edit Anyway button displayed on the info bar in the backstage view . Here’s a quick tip that highlights PowerPoint’s easy to use Photo Album. Remember the time when slideshow, meant a carousel of slides with you sitting in a dark room while [insert familial relation here] clicked through a series of pictures from some vacation? Take a retro moment; throw-away that text based presentation you have been struggling with (let’s face it, no one reads that stuff anyway) in favor of an old fashioned picture slideshow. On the Insert tab, in the Images group, click the top split of the Photo Album button. The Photo Album dialog appears. Click the File/Disk button. 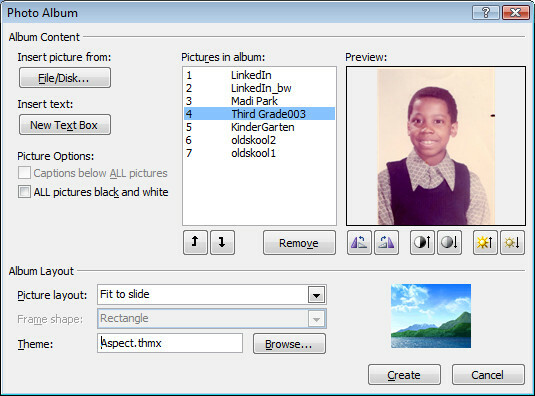 The Insert New Pictures dialog appears. Navigate to the folder that contains the pictures to be included and select those images. Note use CTRL + CLICK to ‘cherry pick’ images, or CLICK on the first picture and SHIFT + CLICK on the last to select that set of pictures. Click OK to return the Photo Album dialog. Optionally, adjust a picture’s settings by selecting that picture and then clicking the appropriate Move, Contrast or Rotate option. Select a Picture layout (e.g., Fit to slide, 2 Pictures, etc.) and select a Theme. Should you need to edit the Photo album, click the bottom split of the Photo Album button and select Edit Photo Album.